Chelsham and Farleigh remain largely the rural parishes they always were, although the 20th century inevitably encroached. The story of the last 50 years has been one of the decline of its agricultural livelihood and the residents’ need to find other ways of making a living, while trying to preserve the beauty of the area and prevent unsuitable developments. Chelsham and Farleigh are set in land designated as Green Belt, but that has always been a rather fluid concept and the experience of the parishes has shown that such a designation is no guarantee against development. Constant vigilance and determination have been necessary, largely on the part of the residents themselves, to keep their surroundings rural. An aerial photograph illustrates their situation – in the foreground lies Great Farleigh Wood with St Mary’s Church and the old manor house, Farleigh Court; beyond them, occupying the middle ground, the new Farleigh Court Golf Course, bounded by Puplet and Frith Woods which are owned by Tandridge District Council and Selsdon Nature Reserve. Below the ridge, to the north, can be seen the streets of Selsdon and New Addington, then over the next ridge the towers of Croydon and the sprawl of Greater London. The first campaign the people of Farleigh had to wage was simply to be recognised as a rural parish. Before World War II the planners had assumed that suburbia, which had already reached Selsdon and Sanderstead to the north, would inevitably creep over the hill into Farleigh. For that reason, when local government was reorganised in 1933, the parish was transferred to the Urban District of Coulsdon and Purley, whereas Chelsham, which was further away from London, remained with Godstone Rural District. The coming of the war put a stop to any further suburban development, but when the boundaries of Greater London were extended to include all built-up areas in 1965, Farleigh was nevertheless swept up with Coulsdon and Purley into the embrace of the Greater London Council. Farleigh residents protested that their parish was still a rural one and should instead be returned to Godstone. The redoubtable Dr Cecil Prime and the Residents’ Association produced a comprehensive survey and history of the parish, which was likened to ‘a new Domesday Book’, and this evidence, together with the united opposition of the residents, eventually achieved the result they sought. 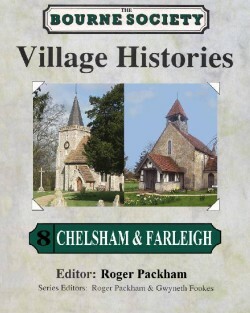 On 1April 1969, Farleigh was returned to Godstone Rural District and was joined administratively to Chelsham, with a shared Parish Council. (In 1974, Godstone RDC was amalgamated with Caterham & Warlingham UDC to form the present Tandridge District Council). So delighted were the residents at this victory that a ‘Farleigh Festival’ was held that summer to celebrate what is still remembered locally as ‘the Escape from London’. The Festival programme told the tale, concluding — ‘(now) we can be sure of getting the facilities needed by a farming community and avoid such decisions as that taken by Croydon Corporation…..to install sodium street lights throughout the country lanes of Farleigh’. Electric light eventually reached the area’s few street lights in about 1970 but was only laid on to the farm cottages at Little Farleigh Green in 1977. Even then it was a somewhat precarious supply, which went off every time there was a thunderstorm, so those in residence were still reliant on candles at times.